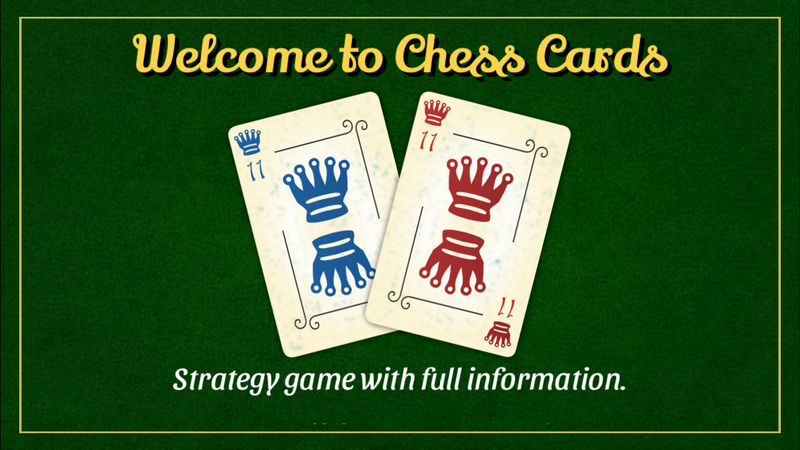 Chess Cards Game is a strategy game with full information played with a set of just 20 cards and simple rules. The game may have simple rules but is challenging and requires smart thinking and forseeing the moves of the opponent. 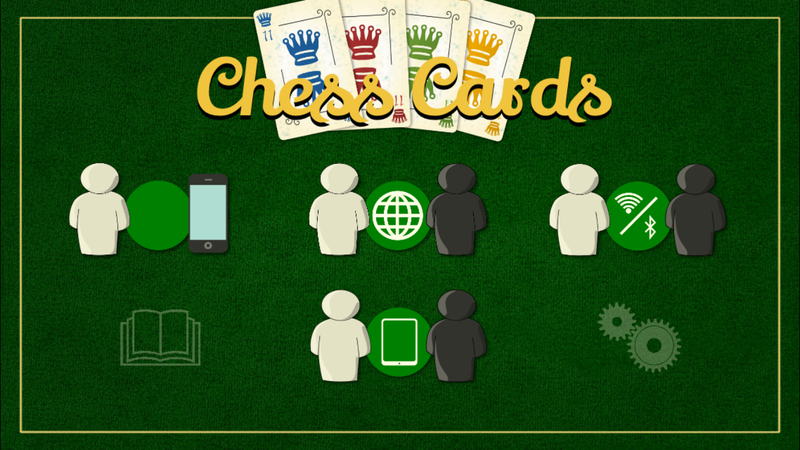 Chess Cards Game is based on the Mate game created in 1915 by G.Capellen and selected modification ideas by Edward Lovett. The app contains short tutorial which helps you to learn the rules in no time, but here are some more details about the rules and the app itself. blue > red > yellow > green. Queen (11) > Rook (10) > Bishop (4) > Knight (3) > Pawn (7). Please note: the order of card values is different than ranking. Each match consists of two rounds and the players exchange the cards after the first round. In this way the match result doesn't depend on the luck of the initial draw, but on the strategic skills of the players. Starting player can begin the turn with any card. The opponent must reply with the card of the same suit or, if the card of the same suit is not available, with the card of the same rank. The player who played the highest card within a suit, or the highest suit when the same rank is played, starts the next turn. 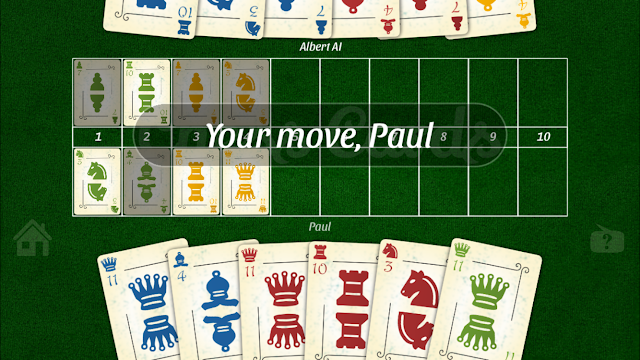 The app shows which player has won the turn by highlighting the winning card. When the player can't make a valid move it is the Mate. 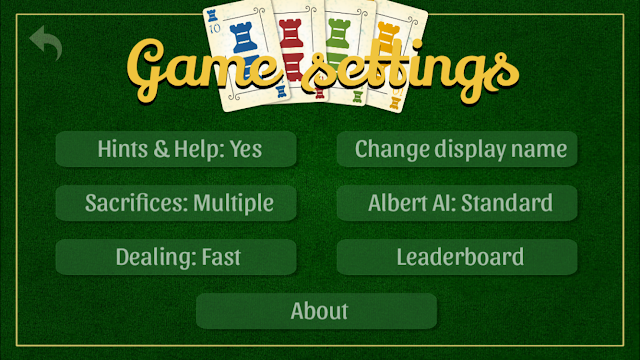 The score is calculated by multiplying winning card value by move number. For example if the mate was done with bishop (value 4) in 8th move the score for winning player is: 4 x 8 = 32 points. 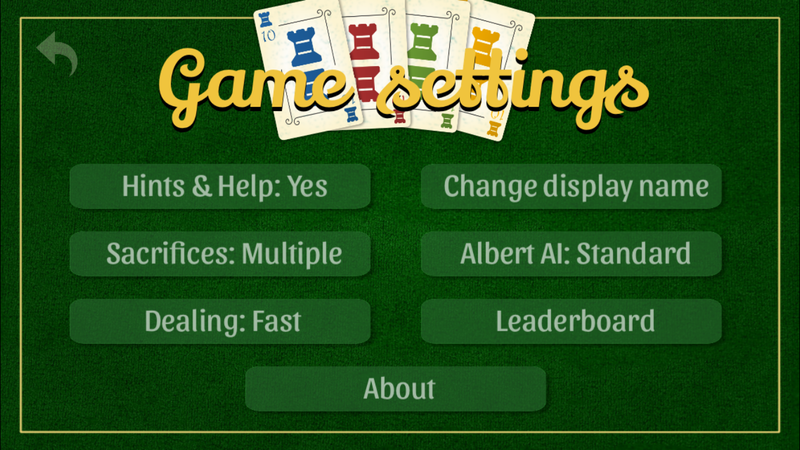 In the settings of the app you may choose advanced mode of the game - sacrifices - before you start the match. If sacrifices are allowed then the players can get rid of one card ( if single sacrifice is set) or multiple cards (if multiple sacrifices are set) before their turns. Sacrificed cards are not used during current round and playing in this mode may dramatically change the outcome of the game making it even more challenging and interesting. When playing with sacrifice cards the score is calculated by multiplying winning card value by the sum of winning player's sacrificed cards and move number. For example if you have sacrificed 3 cards and you have won the round with bishop (value 4) in 6th move the score is: 4 x (6 + 3) = 36 points. 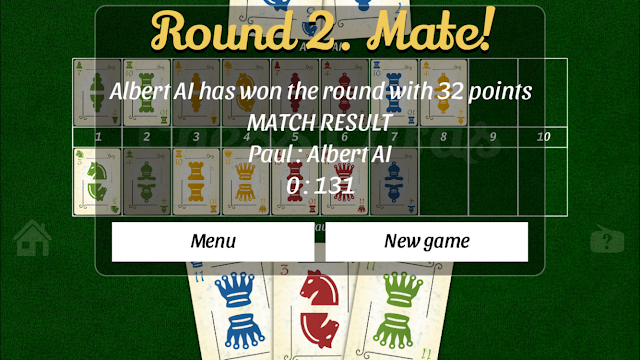 Please note: mode with sacrifice cards is not available when playing solo game (with Albert AI). If you have sacrificed cards, it may happen you will have less cards on hand than your opponent after several turns and eventually you will run out of cards when playing. In this case the last card you've played is used for all your consecutive moves. If you win the game in these circumstances and the sum of your sacrificed cards and move number is greater than 10 it is the overmate. The score is additionaly multiplied by this sum - 9. For example: you have sacrificed 3 cards and you have won the round with bishop in 8th move. The score is calculated first as above for sacrifices ie. 4 x (8 + 3). As 8 + 3 = 11 and is greater than 10 the score is additionaly multiplied by 11 - 9 = 2. So, final score for this overmate is: (4 x (8 + 3)) x 2 = 88 points. The final score of the match is the sum of scores from both rounds of the match. If you win the match then your ranking is calculated as difference between your final score and your opponent final score. If you are playing Game Center match your highest ranking is saved on the Game Center ranking leaderboard. Game Center game - in this mode you can play with your friends or other players around the world via Game Center. This menu contains also button for tutorial and settings menu. About - about the app. Congratulations with the app release! If you want to have more users and downloads, our services will be helpful. Promoarrow is a marketing agency for iOS applications. 1. Announcements to app review sites. We send requests on your behalf to editors of app review sites. There're different lists of recipients. Prices start from $30. 2. Positive comments and high ratings on App Store. The comments are posted by real people from different devices with unique IP addresses. The price for one comment + 5 stars rating is $3. © 2015 Pawel Klarkowski. Background from www.myfreetextures.com. Travel theme. Powered by Blogger.